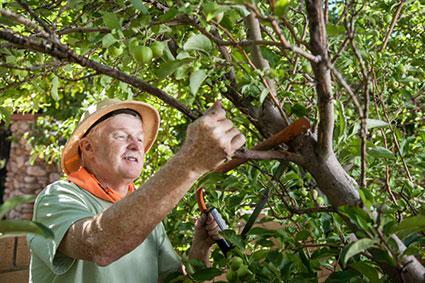 Detailed instructions for pruning fruit trees can assist novice gardeners in one of the most important tasks related to fruit production. 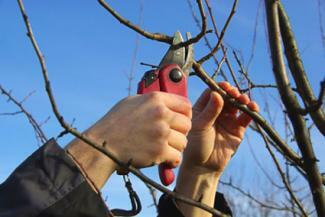 Pruning makes a tree look visually appealing, helps sunlight to reach new fruit, and can help to increase fruit size. Knowing when and how to prune your tree can help to keep your fruit trees healthy and bearing fruit year after year. 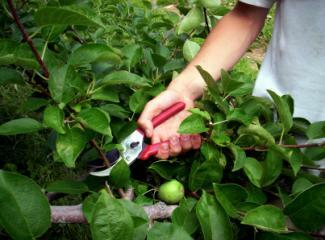 There are mainly three types of cuts employed in pruning. They each serve different purposes. Thinning involves the removal of the entire branch. Unwanted branches, both healthy and diseased, are cut off. They should not ideally promote new growth below the cut end; hence the cut is done as close to the origin of the branch as possible. Heading is usually done on the new branches. The terminal, or top, portion is removed so that the branch is strengthened, and the buds below the cut are invigorated into growing as shorter sub branches. This cut is used not only to promote branching but to keep the tree within the desired area. Bench cuts are mainly used on vigorously growing vertical branches that may crowd the center of the tree. They are cut deep down to any lower branches arising from them that grow outwards. Cutting off any branch, whether it is new or old, thin or thick, is hard on the tree. Open wounds can invite infections. The trauma of pruning should be reduced as much as possible by using the correct tools. They should be very sharp to keep the damage to the bark minimal and to facilitate faster healing. Dull blades crush the branch, causing unnecessary damage to the tree. The tools should be disinfected prior to pruning. They should be disinfected again after cutting diseased branches to prevent the spread of disease. Hand pruners are easy to use and make precision cuts. They can be used for thinning out or removing up to ¾-inch thick soft green wood and ½-inch thick older wood. They come in bypass and anvil forms. Loppers are used for cutting branches 1 to 2½ inches in diameter. Most fruit trees, including apple, pear, and peach, require these for pruning. Long handled loppers can be used to cut out-of-reach branches. Even though hard to wield and maneuver, the long handled loppers are necessary for most fruit tree pruning. A pruning saw is essential for sawing off branches thicker than two inches across. Fruit trees are pruned from the very first year of planting. The aim is to get the tree to start branching at the desired height, or to allow only good braches to grow if it already has several branches. Almost all fruit trees follow the same pattern in the first three years when establishing the basic structure is the main objective. Cut off branches of a newly planted young tree 30-36 inches from the ground. Make the cut ¼ inch above a good bud at this height. For container trees, strip the lower branches and ones that are vertically growing too close together. Cut these flush with the main stem. Select only three to five healthy, well spaced branches growing outward in different directions. These will be the main bones of the tree. Remove all others, cutting them flush with the stem again. The main branches would have developed lateral branches by now. Remove all but a few healthy, adequately spaced ones per branch. After the third year, the pruning patterns and seasons may vary between trees. The objective is to help the tree produce fruit in optimum quantity and quality. Trees that are not pruned may have delayed fruit production and in some cases, excessive production of substandard fruit. Different fruit trees will need pruning at different times in the growing season. This is the main pruning season for ensuring fruiting in the next season. It is much easier to see what you are pruning when a plant is dormant and pruning at this time prevents new growth until spring. The energy can be directed to flowering and subsequent fruit production in this way. Remove any dead or diseased branches flush with the main stem they arise from. Use bench cuts to remove branches that are crossing each other as their constant rubbing can damage the bark and invite infections. Cut off branches growing into the center of the tree; they prevent sunlight from reaching the tree center and reduce air circulation that helps keep away diseases and rot. Shorten previous year's growth by about one-third to encourage the development of new branches and fruiting spurs. Trim the main branches when the tree has already reached the desired size. Trim the side branches leaving only five to six buds on each. Free standing apple and pear trees are examples of fruit trees that benefit from dormant pruning. The objective of the initial years of pruning was to create an open goblet shape with four to five main branches. Once this framework is established, the trees are pruned in subsequent years to form new fruiting wood. Although it has long been thought that dormant pruning is best for all deciduous trees, it now seems that after harvest pruning, or summer pruning, is better for some types of fruit bearers - especially stone fruits. Pruning after harvest helps cuts heal faster and reduces the risk of a fungal or bacterial infection. Below are some common fruit trees that benefit from after harvest pruning. Cherries bear fruit on one-year-old branches as well as in older branches. The objective of pruning is to maintain a balance between old growth and the formation of new branches. Cut off all diseased and weak side branches flush with the main branches. Remove one out of every four of the old fruiting branches to promote the growth of new branches. Free standing peaches and nectarines are grown in a four-stemmed Spanish vase shape, where branches come out from the sides into a lovely round shape. They bear fruit on one-year-old branches only. Cut off diseased and weak branches close to the main stems. Remove any branch that has already borne fruit. Remove branches that prevent sunlight falling on one-year-old branches as these will die off in the absence of sunlight. 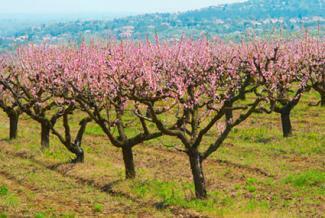 Plum trees are grown with a central stem with side branches arising from it at regular intervals. The fruit forms on the spurs arising from the older branches. 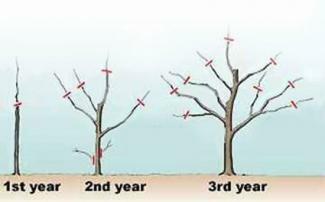 If you cut branches older than two years, only vigorous vegetative growth will result. Hence they are pruned very lightly. In summer, vigorous upright shoots are removed. Light thinning of the spurs can be done in early spring to avoid crowding. 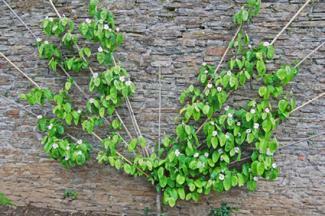 Apple and pear trees trained as espaliers, fans, or cordons are also pruned in summer. The pruning window is short and is between late August and early September. The objective is to allow more sunlight on the ripening fruit and to ensure good cropping the coming year. Cut off any vigorous shoot growing upright from a stem. New shoots more than eight inches long, and growing from a main stem, will have a cluster of leaves at the base. Cut back these shoots three leaves above the leaf cluster. Thin out overcrowded new shoots that are less than eight inches long but leave them alone if they are evenly spaced as they are fruiting spurs. If there are new shoots growing from the sub stems, cut them back to one leaf above the basal cluster of leaves. Some apple trees, such as Golden Delicious, Pink Lady, and Fuji, are tip bearers with fruits growing on their one-year old branches. Their older branches should be pruned hard, cutting back quite a bit, to make way for new branches for the next year's fruiting. Spur bearers, such as Sundowner, Royal Gala, and Granny Smith, bear fruit in two- to three-year-old short fruiting branches called spurs. These are only shortened so that they will continue to bear fruit in the same branches year after year. In a few years these short branches will lose their vigor. When that happens, they are completely removed to form new fruiting spurs. All shortening cuts should be made just above a healthy bud that is facing outwards in the desired direction, but never inwards or upwards. The cut should slant away from the bud. Sharp tools should be used so that the branch does not get crushed. Flush cuts should be done close to the point of branching, but leaving the small bump at the fork intact. This prevents infections at the cut site affecting the rest of the plant. When cutting large branches, do it in three steps. First remove the main bulk of the branch. Then make an undercut near the desired point to prevent the bark tearing. Finally saw it down from top, making the cut slanting away from the fork. More than one third of the tree should not be removed in one pruning. Wound dressing is not necessary, but if used, it should be done thinly on the cut ends. When you buy new trees from a nursery, request that the trees be pruned before purchase. There may be an extra cost involved, but it will save time when planting your new trees. If the trees have already been pruned, no additional pruning will be necessary until next year.